I don't know about you, but as much as I love the written word I find myself drawn in to read blog posts that contain pretty pictures. They always grab my attention and pull me in for more. I wanted to share some of the gorgeous photos that I have stored in my inspiration file. I hope these images will become as much of an inspiration to you as they have been for me. 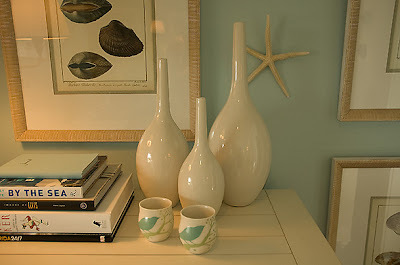 I've captured them for their use of small spaces or color, others for their elegance and their display of accessories. This modern style with traditional elements meets glamour is typically the style that I like to implement into my interior design projects (client willing of course). I love the clean lines of this bathroom, the lighting just sparkles and it is so serene. It looks clean, airy and hotel-inspired. I would however omit the elyptical machine. This is a Candice Olsen Design. 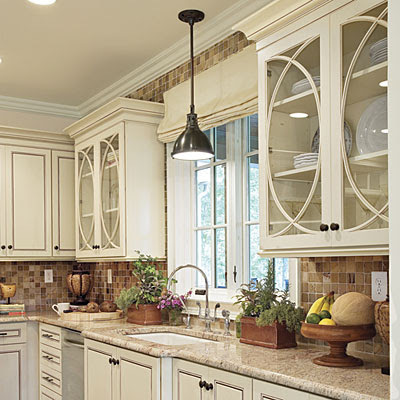 I love the detail on these elegant, glass kitchen cabinets. All of the elements feel so cohesive, warm, earthy and inviting. While I can't see the floor, it would be great paired with some dark wood hardwood floors. This is an image from the ever-amazing Designer Sarah Richardson. I am in love with this soaker tub! So pretty and serene, this Potterybarn room is easy on the eyes and would make a great guest bedroom. I've modelled our guest bedroom/my office after it, I have a replica of that white duvet with blue beading and white furniture. The walls are to be painted the same pale blue/grey color later this month. I love the crispness of white and I love vintage pieces with a modern twist. I am currently looking for a thrift store version of this writing desk and a chair for our den. This would create a separate working space for me when guests take over the guest bedroom which also happens to be my office. As much as I love neutrals, I am drawn to this shade of green as it compliments the white and espresso wonderfully. The dark hardwood floors complete with cream rug and black and white polka dot sheets are light and refreshing. This wall color would be perfect as an accent wall, a whole room might be too much. I just love beachy accessories-pale blues, whites, sand, and books to curl up with are recipe for a perfect beach house, along with an ample supply of white furniture and accessories. Everything here is simple and pretty. I believe this image was taken from the HGTV.com site from the 2008 dream home giveaway. This striped accent wall really makes this room. With a simple set of framed artwork hung above the bed, a pair of pretty, contemporary lamps and some patterned pillows, this room has a light, neutral feel with a pop. 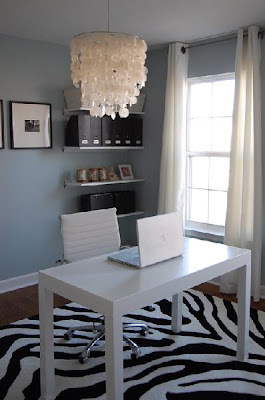 The drapery, desk and wall color are so airy and light so I love that the floors are a contrast with a chocolate brown and cream zebra rug on top of dark hardwood flooring. The lamp is super fun and adds a touch of glamour to the room. This room's look is completed with classic black and white framed photography. I adore the carved detail of this black desk's wooden legs. Now that is one comfy office chair! I love the shabby chic, worn-in look of this budget style. 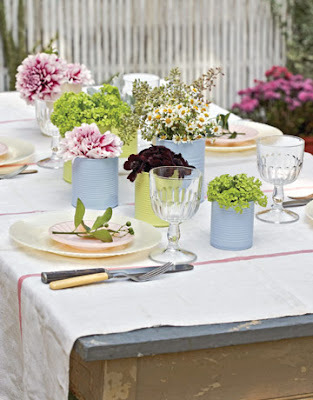 A linen table cloth, colorful spray painted tin cans filled with garden blooms and vintage glassware and cutlery. What a pefect outdoor garden lunch setup. This is another Sarah Richardson Design. 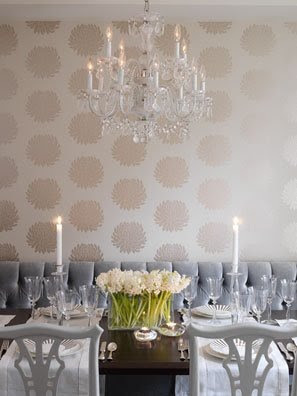 I love the detail of these dining chairs in contrast to the soft, plush and pretty banquette seating opposit them. Most of all I stored this pic for the gorgeous, shimmering wallpaper detail. What dining room is complete without a stunning chandelier? This photo may look familiar because it is from THIS organizing post from last month. 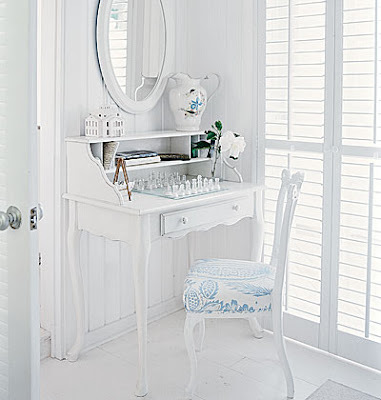 I love the feminine details and French country style. This is a room I'd enjoy doing laundry in! I heart fillled apothecary jars. I believe this is a Candice Olson Design. I love how this large room is used in so many great ways. I would never want to get up in the morning and leave! The soft palette and lighting make it a clear winner! I love this Sarah Richardson entry design. That chair is beautiful! I would love a set at a dining table. The grand mirror really opens up the space, adds light and provides even more glamour. * I have filed many of these for years and I kept them for what they bring to the table visually. I do not however have the image sources. If any photos belong to someone reading this blog, please by all means contact me and I'll add your link under the photos. The photo at the top of this post is what appears on my computer's desktop. It could be the perfect intimate wedding reception for a small gathering or an outdoor room to be enjoyed daily. The white linens, blush roses and outdoor drapery are so soothing. 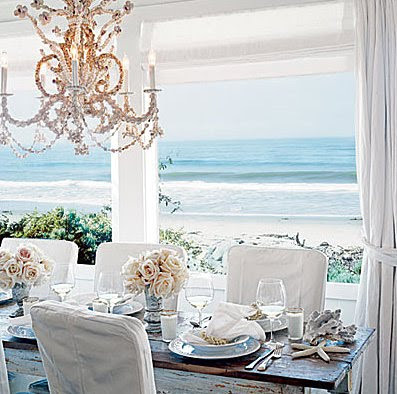 I adore the whimsical touch of the elaborate chandelier hung above the worn look of the wooden table. What beachy area is complete without starfish and seashells? I love the ocean and dream of living by the sea in a glorious beach house one day. Until then, I can dream! 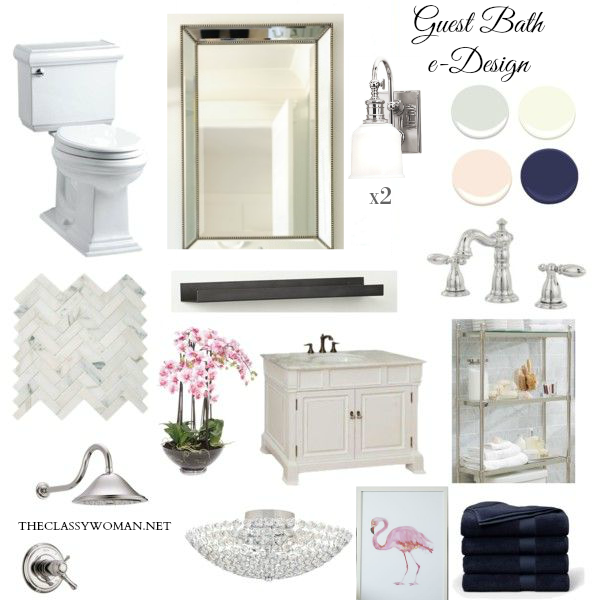 What are your favorite websites or blogs for decorating inspiration? What room(s) are you currently decorating or planning to redo? Beautiful photos. I absolutely agree with you on the black wooden carved legs of the office desk and the plush armchair - Wow!!! 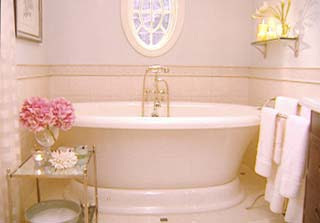 Oh, what I would do for that beautiful pink room with the soaker tub! LOVE the photos! I am thinking about an update to my kitchen so I love the kitchen photo! What do you think the countertops are, marble? Love the little desk, I want one, too! 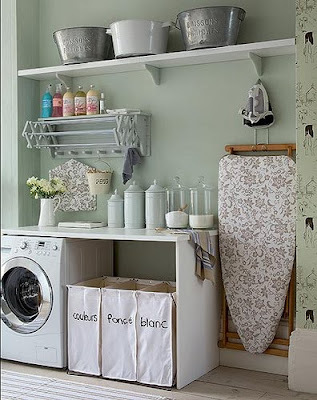 The laundry room Is awesome, now I have to add that to my list...Love the beach accents. Keep up the good work! I haven't posted in a bit because I have been in your neck of the woods~love S. FL! So much beautiful eye candy! I wish I was IN that first photo right now. :-) Candice is one of my favorite designers too so I always love her rooms. Hope you're having a great day! We are just now starting to "class up" our home, starting with our furniture. Today we bought dining chairs! Our old ones were so awful! These photos make me want to go do more! The second to last photo is a Candice Olson Design. I think it first aired in Jan. 2008. It has been the inspiration for my master bedroom remodel. So exicted I found your blog through this picture and looking forward to being insired by Karla. 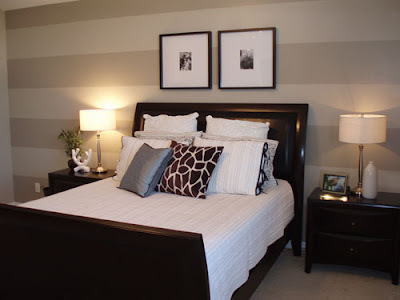 I LOVE the striped walls in the bedroom picture. Do you happen to know the colors used to paint the stripes? Thanks! That is indeed a Candice Olson designed bedroom which happens to be mine! And yes, it is hard to leave every morning.